Horse Creek Sale Company, LLC is a trusted horse auction company based in Colorado. With more than 40 years of experience and a commitment to superior service, our auction features a quality selection and fair prices on which you can depend. 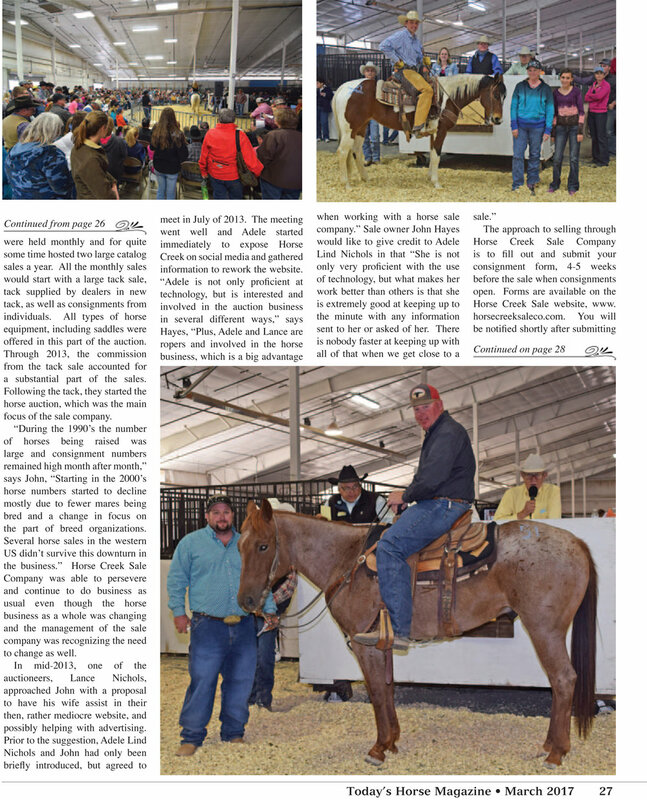 John Hayes, owner of Horse Creek Sale Company, LLC, is a fifth-generation Coloradoan who has owned horses in the Akron, CO area for more than 45 years. For the past 26 years, John has been involved full-time as an agent for a variety of clients across the country, buying and selling horses at some of the nation's leading sales. He has also traveled to South America and Europe as a consultant for horse breeding programs. Our auctioneers are Joel White of Pauls Valley, OK, Lance Nichols of Severance, Colorado and Michael Nichols of Flagler, CO. Raylene Israel is the Sale Office Manager. Marketing and Consignment Manager is Adele Nichols. We have a friendly and dedicated team to assist you on sale day from check in through payment including; Ron Berndt, Art Parker, Sue Israel, Michael Hetimann, Jon Flack, Keri George, Ally Kvatchkoff, Craig Weichel and Pam Musgrove. Horse Creek Sale Company, LLC is bonded and insured. Our auctioneers and several of our associates are members of the Colorado Auctioneers Association and the National Auctioneers Association. Horse Creek Sale Company, LLC adheres to the professional and ethical guidelines set forth by the associations' Code of Ethics.